I made a batch of brownies last night ready for having four of the kids’ friends over today. I always thought brownies were a cake or cookie recipe gone ‘wrong’ but then tasted so amazing, that people kept making them….. didn’t you? But no, it would appear ( I Google-researched it) that they were actually specially created for a ladies’ fair in Chicago where the organizers wanted a snack that ladies could eat more simply than a piece of cake and that they could hold in their hands. So the truth may not be so romantic as some chef accidentally discovering pure culinary gold, but we all love to eat brownies! 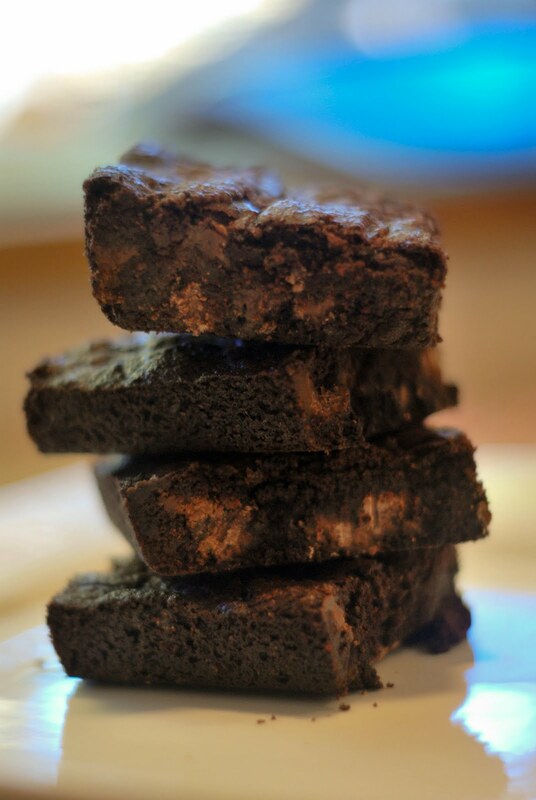 I have eaten lots of good brownie, but didn’t have a hard and fast recipe that never let me down. That all changed when I started baking for youth group. Then I knew it was time….time to seek a legend to claim as my own. Cause what is the point of reinventing the wheel? I did my research and learned that The Barefoot Contessa’s brownie recipe is pretty much the unofficial world’s best (please do not quote me on that) judging by all the raving comments of those who had tried it and ADORED it! I was desperate to try the recipe but it was late at night and I didn’t have all the ingredients in my pantry….so I looked for the world’s second best brownie and found it at: Kitchen Illiterate and since I made it the first time, I haven’t strayed from it. No going back for me…though I have adapted it a little. Click on the link if you want the pure unadulterated recipe…..
As my blog states in its title, I am a lazy cook; I cut corners. This recipe is a forgiving and hardy one, and never lets me down, even though I skip through all of the delicate ( I read ‘tedious’) steps of its creation. And I double the recipe, cause if I am going to go to all that trouble, I want to not have to do it again for a loooong time! So if you do SIMPLE and BIG, we are going to get along! I am a no frills gal. i bake a lot and haven’t got the extra moolah to waste on pretty packaging, though there are exceptions. Whooops! Forgot the eggs, you’ll need a bunch of those! 2. Grease your baking dish. 3. Combine the butter, sugar, cocoa, and salt in a bowl, stir well. 4. Stir in the vanilla extract and the cinnamon. 5. Stir in the eggs vigorously. Once the batter is smooth, shiny, and creamy looking (ummm, mine often isn’t as I have skipped the steps that melt the sugar totally, I like the brownie to have a little crunch. If you really want a glossy batter refer to the above link.) This is what mine looks like…..
6. Add in the flour. Add in the chocolate chips, and spread the batter into the pan. 7. Bake the brownies for about 40 minutes, depending on your oven, until a toothpick in the middle comes out clean. Serve hot with icecream or cold with tastebuds!